Vending Machine Girl: Doritos got stuck! I made this costume for my daughter Kailyn. She is nine and we decided to make a costume. 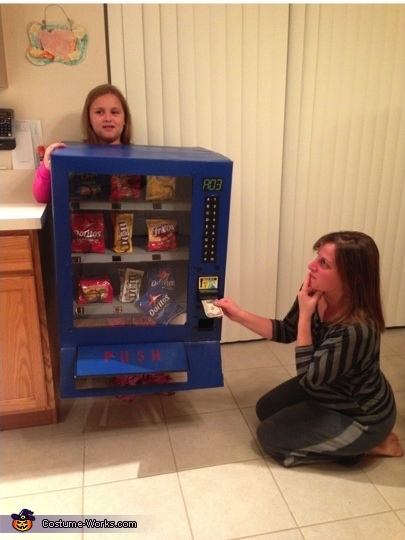 We thought of various ideas... but when Mom told us she was a gift one year, Kailyn and I laughed at the simplicity of that idea and our wheels began turning to see what we could make out of a box, and the vending machine idea was born. We began to think about what would make the costume authentic. I talked to the vending guy at my work building and told him about the idea. He was able to get me some spare parts, the vending coils, the bill slot, and the selection panel. Real food in the machine was a must! And the hanging bag of Doritos added authenticity as well. We used a piece of plastic from a poster frame for the glass. I found rivets online to fasten the cardboard. There is a wall in the machine behind the snacks so that you can't see my daughter's body in the machine. There is a pool noodle around the hole for the head to allow the machine to rest comfortably on her shoulders. Because she is off to one side in the vending machine, there is a handle inside for her to hold onto and balance it out. The dollar hanging out of the bill slot is real. We bought a small wardrobe box from U-Haul so that we had premium cardboard. I will attach a few pics so that you can see all angles of it and how its put together. With purchasing all the random pieces: paints, rivets, snacks, poster frame for the "glass", boxes, decals, and paint pens; the project cost about $80. It was fun to do as a father daughter project.